Or in other words, Happy Chanukah! (If you don’t know who Latke Larry is, you’ll want to watch this video – yes that’s Jerry Stiller, and yes, he’s real, I know because I gave one to my roommate). 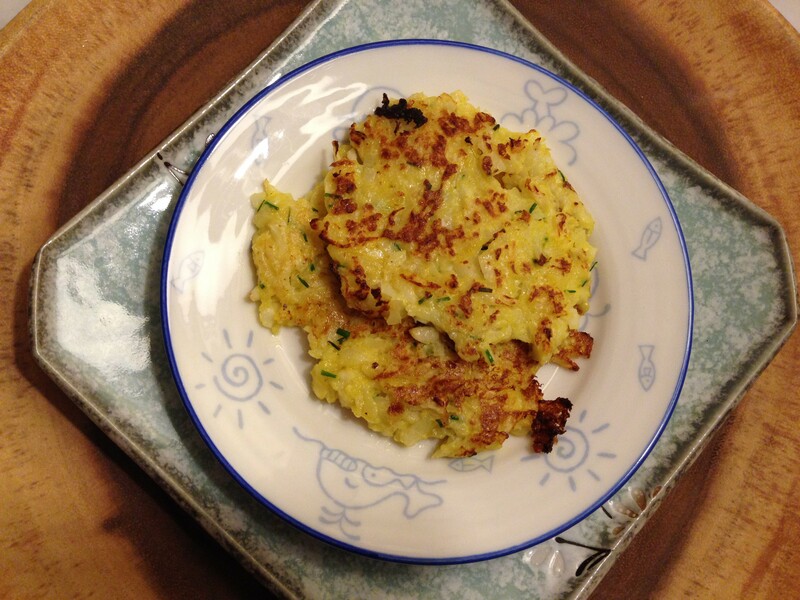 What’s more Chanukah than latkes? 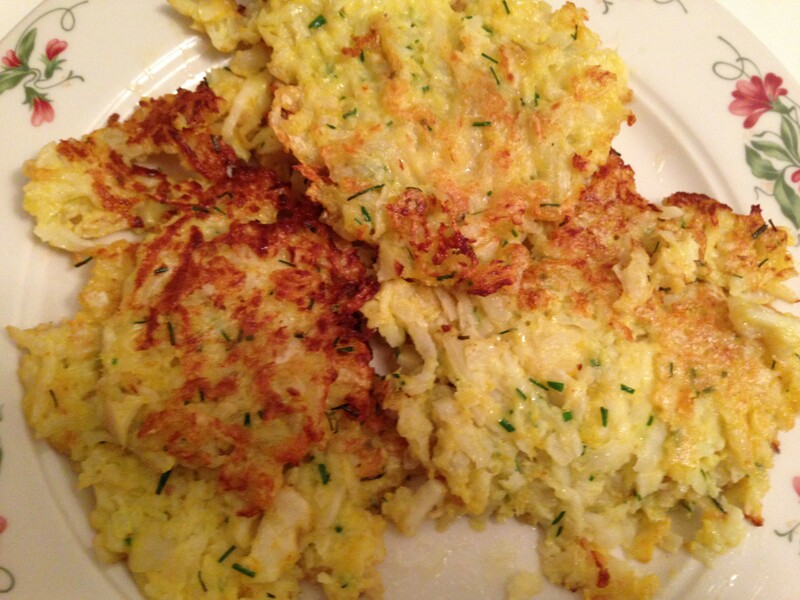 I’ve eaten these latkes many-a-year at my roommate’s home. They are SO GOOD and when people say that their mama’s latkes are the best in the world, they’re really talking about these (gauntlet thrown). 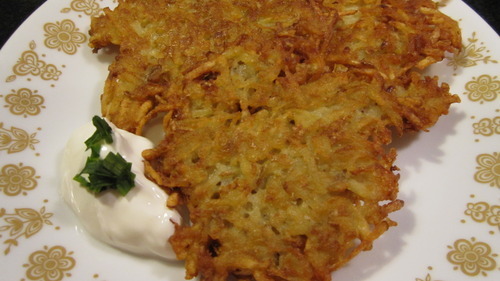 These latkes are thin and crispy, lightly salted, and basically just glorious. 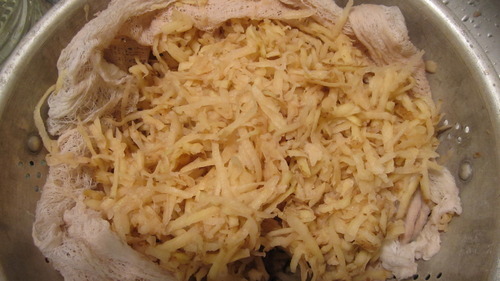 They get their amazing texture from having (almost) all the potato juices squeezed out of them and you really want to try to get your potatoes as dry as possible. 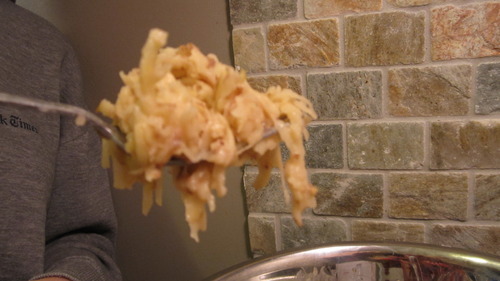 Really, the unsung hero of the latkes is the fork. whaaat? 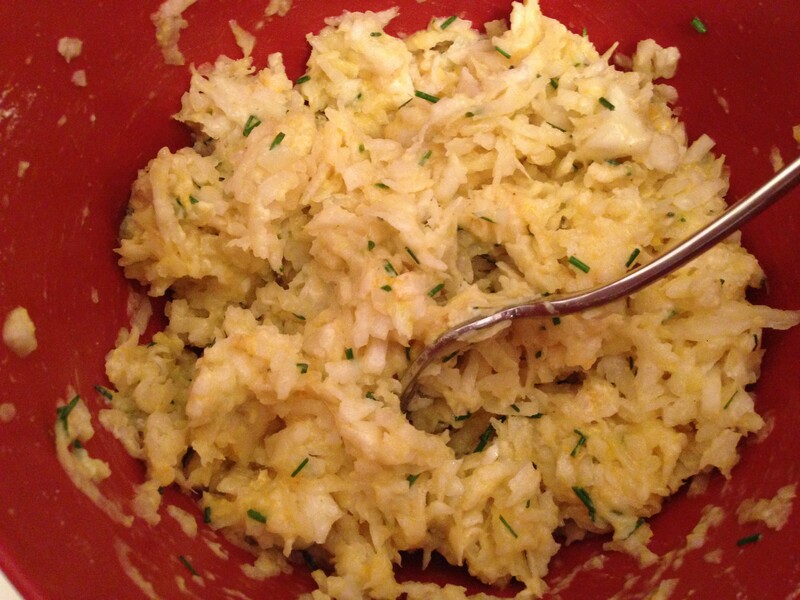 Yes, as my roommate kindly informed me, the fork is key to the mixing/forming/cooking of these latkes. First, you want to “whisk” the batter together with a fork so that the potatoes stay separated and they all get coated with the egg mixture. 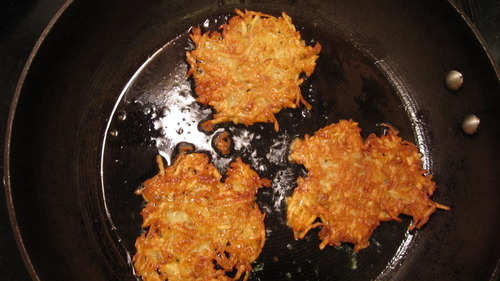 Then, you measure out the latkes with a fork, and lightly fluff them out in the pan – again, fork. 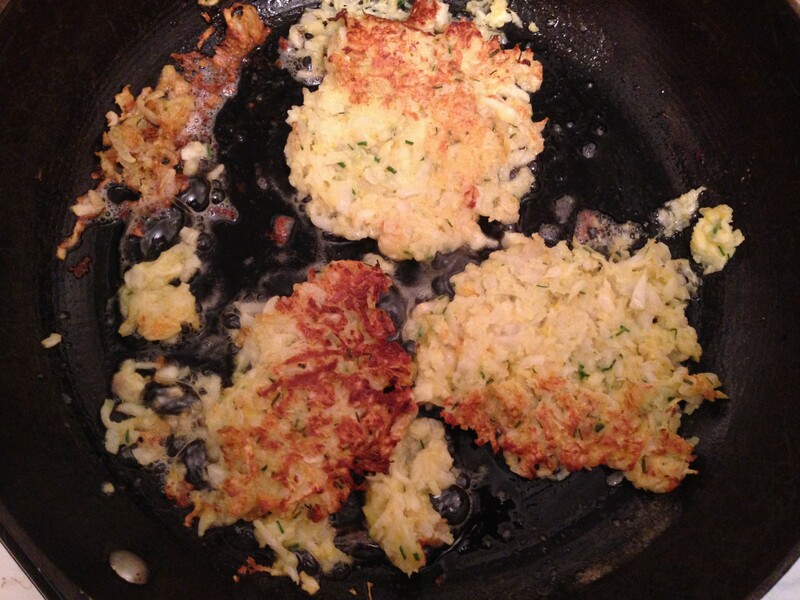 Lastly, as you’re cooking the latkes, you can gently lift them up to peak at the underside …with a fork! Okay, last tip. If you somehow don’t eat all of these latkes immediately, you can freeze them (they’ll last about a month) or just keep them in the fridge for the next day! Make sure you reheat them in an oven or a toaster oven – if reheated in a microwave, you will be haunted by all the latkes of Chanukahs-past. 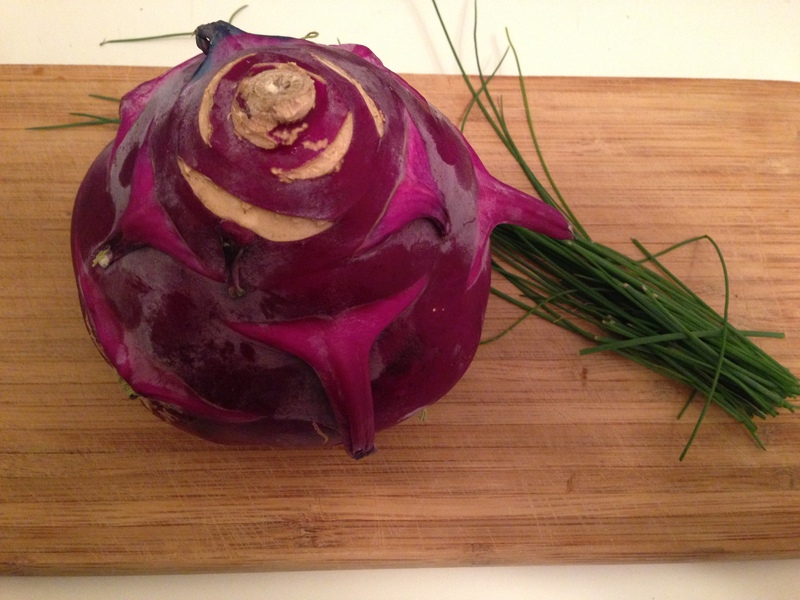 And with that, I’ll bid you a fond Chanukah Sameach!